In the history of White House, it is for the first time a Jain Organsation has been invited to have its function. JAINA is really overwhelmed and proud to be the first organization to create this history. On October, 7 , 2016 a 70 member delegation under the leadership of Ashok Domadia, JAINA President, along with Acharya Chandanaji, Sadhvi Sanghmitraji and Sadhvi Sahejaji visited White House. This was the very first time White House invitation was exclusively for Jains. 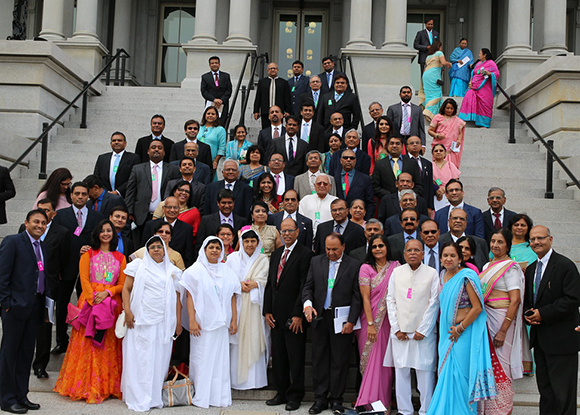 70 Jains –including 35 JAINA directors and officers from all over the US and Canada attended the briefing at the Eisenhower Executive office building. Also in attendance was Mr. Sudhir Lodha, a member of the minority commission, Government of India who had flown in especially just for this event. Mr. Zaki, Senior White House Director of Public Engagement welcomed everyone. Next Melissa Rogers, President’s Special Advisor, spoke of President Obama’s agenda of reaching out to members of all the minority religions and letting them know that the front door of the White House is open to members of every faith regardless their strength of numbers. Sadhvi Sanghmitraji and Narendrabhai Shah from Ahemdabad recited various jain prayers. Acharya Shri Chandanaji addressed White House officials and briefed them on importance of Ahimsa as solutions to many modern day issues. JAINA President thanked White House officials, Pinal Mazmudar, Haresh Shah and all volunteers for their efforts. It gives me an immense pleasure to stand before you today and represent 150000 of members of the Jain community of North America. Jain community is founded on the basic tenets of Non-Violence and World Peace. Jain Community has been an integral part of the American social fabric and has contributed to the nation’s social and economic development. Our members have always been known for our peace loving ways. Today, as the world faces turbulent times, Jain principle of “Live and Help Live” can potentially provide the solution we all seek to violence in this world. Founded thousands of years ago by Lord Rishabh Dev our first Tirthankar, our religion found further global acclaim under the guidance Bhagwan Mahavir, our 24th Tirthankar, 2500 years ago. I trust that you will appreciate that 2500 years ago most of the world, as we know today, did not even exist. 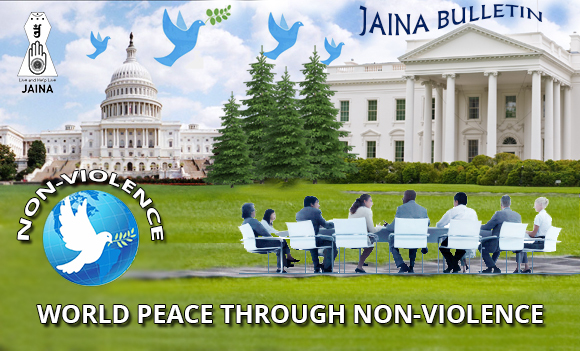 Our belief in the core guiding principles of world peace and non-violence is a reason why, across the centuries and across the world, you have never heard of any form of violence perpetuated or propagated by members of Jain community. Click here to read complete speech. At the Capitol Hill event in the Rayburn building the mood was festive. 200 Jains from all over USA and Canada joined in a procession in the Capitol Hill hallway singing and dancing. Padmavati Devi Poojan was conducted by Narendra Shah (Ahmedabad), Naresh Shah (NY) and Dr. Kirti Shah. Virginia State Senator Richard Black was the invited guest and he spoke admirably about India’s standing in the world under the leadership of Prime Minister Narendra Modi and the Jain community he had come to know. JAINA presented a shawl and a Jain memento to Senator Black. There was a welcoming dance performance by a group of young girls from Jain Temple of Virginia. JAINA President Ashok Domadia gave a presentation on JAINA activities and Gunvant Shah, JAINA First VP, invited everyone to upcoming 2017 Convention to be held in New Jersey. Events concluded with a sumptuous Jain dinner. TV Asia will broadcast coverage of Capitol Hill on 16 Oct, 2016 at 10:30 PM EST and 10:30 PM PST.